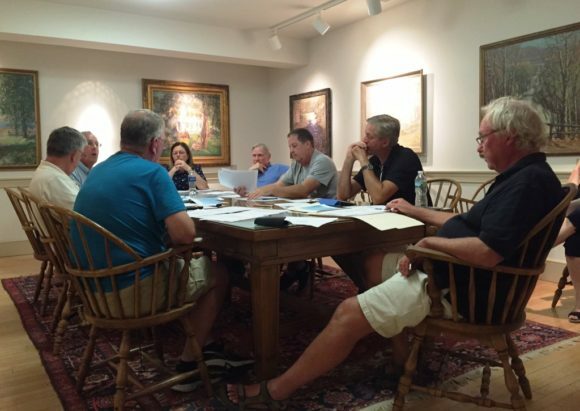 Members of the Boathouse/Hains Park Improvements Committee gathered in Old Lyme Town Hall’s mezzanine conference room for last Monday’s Special Meeting. 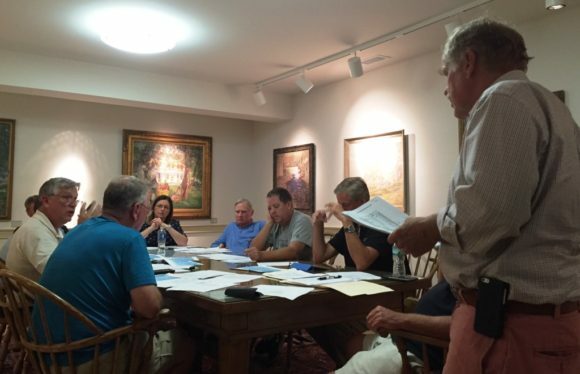 Members of the Boathouse/Hains Park Improvements Committee (BHPIC) clashed repeatedly at a Special Meeting held last Monday (Sept. 12) in the Old Lyme Town Hall. Tensions were high since work on the boathouse — which had begun in mid-August — had been subject to various delays and cost increases. The delays had arisen after it was determined that the existing foundation on which it had been planned to construct the new boathouse, was not strong enough for the new building. This, in turn, meant significant additional costs were about to be incurred to demolish and rebuild the foundation. 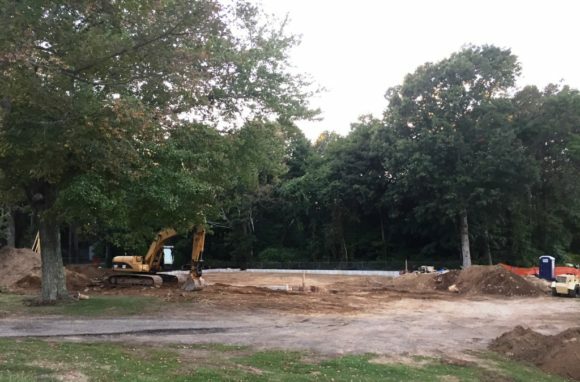 The old boathouse has been demolished and construction has begun on the boathouse at Hains Park. The first item on the agenda was to review a draft project budget, which had been requested some three weeks previously by Old Lyme’s Finance Director Nicole Stajduhar and Old Lyme Town Treasurer Timothy Griswold. Paul Gianquinto, BHPIC Co-Chairman, had distributed a draft budget dated Sept. 8, to the committee but Old Lyme Parks and Recreation Committee Chairman Robert Dunn maintained the document, “… is not a budget.” He described it as an “expenditure budget” and contended that the committee should not move forward with any further expenditures until a “proper budget” was not only established but also agreed with Stajduhar and Griswold. Dunn declared unequivocally, “This project has escalated to anything beyond what we thought.” To support that contention, he noted the original project budget of $883,000, which was approved by the town at an Oct. 6, 2014, meeting (based on numbers agreed by the BHPIC on Sept. 30, 2014) showed $44,000 budgeted for the architect, but he noted that number now stands at over $63,000. Similarly, Dunn said the estimated (proposed and committed) construction costs for Phase 1 (construction of the boathouse) had risen from the budgeted amount of over $533,000 to over $706,000, representing a 30 percent increase. The original number ($533,900) had been presented to the community in a update by the Old Lyme Selectmen on Jan. 25, 2016. Construction equipment being used during the project stands on the site in front of Rogers Lake. The project is funded by a State of Connecticut Small Town Economic Assistance Program (STEAP) grant in the amount of $478,000, which was approved in 2013, and an additional $405,000 that was approved at the Oct. 6, 2014, Old Lyme Special Town Meeting. An additional $50,800 was raised from private donations and added to the funds for the project. The total available for the project is therefore $933,500. Dunn explained his major concern regarding the cost overruns relates the fact that as costs rise beyond the original budget for Phase 1 (boathouse construction), the amount remaining for the items that benefit the broader community (Phase 2) diminishes. 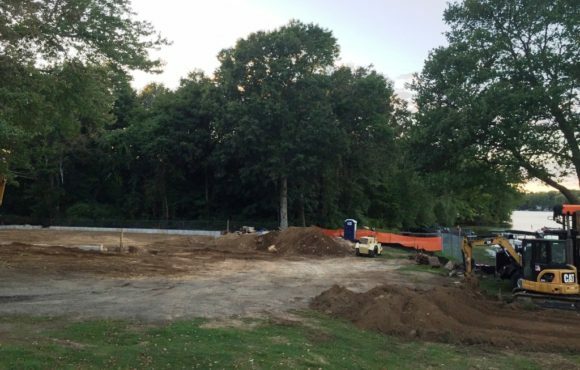 That amount related to Phase 2, which the Old Lyme Selectmen noted in their Jan. 25, 2016, update to residents was $219,988, was intended for upgrades to the bathrooms, improvements to the parking lot and a community gazebo. Old Lyme Town Treasurer Tim Griswold (standing) makes a point during the meeting. A new foundation must now be laid for the boathouse. Bugbee asked what would happen if there were insufficient funds to “do a bathhouse.” Gianquinto responded that there were three possibilities — to collect additional funds, to reduce cost of the boathouse through value engineering or to place the bathhouse in the capital plan and treat it as a separate project. Reemsnyder pointed out that a similar situation had arisen with the Sound View project, which had originally included restrooms and a green, but that for cost reasons those items had now been removed from the plans. When the vote was taken on the motion, it was defeated five to one with BHPIC Co-chairmen Gianquinto and Paul Fuchs voting against it joined by Old Lyme Rowing Association Chairman Gregory Hack along with BHPIC members John Parker and Philip Carney. Dunn voted in favor of the measure and Bugbee abstained. The change order Griswold mentioned was to demolish and replace the foundation. 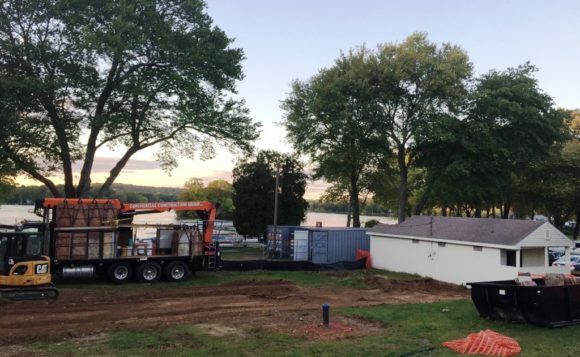 When it was discussed at the previous week’s Old Lyme Selectmen’s meeting, an amount of approximately $110,000 was being considered, but Gianquinto had negotiated during the ensuing week with the contractor and achieved a cost reduction to a little over $103, 000. He stated he was not happy to be paying the amount but did not feel there was much choice. That change order was approved along with one to delete the cupolas from the boathouse, which saved $5,900, and two others relating to hardware, which both will result in small credits to the budget totaling just over $1,000. The cost overruns on the boathouse project are absolutely unacceptable. This project to update the original boathouse has been under review for years. The cost overruns described in this article are not those inevitable issues associated with many construction projects but reflect very poorly on the project management and oversight. I personally support the rowing program from which many students from Lyme-Old Lyme High School have benefited. However, the boathouse improvement project has been supported by the Old Lyme Rowing Association (OLRA), which has many active members who are not residents of Old Lyme. In fact, the OLRA’s Web page lists the mailing address of their Treasurer as: 37 Laurel Rd, Essex, CT 06426. The Town of Old Lyme has been negligent in failing to assess appropriate non-resident fees for use of Town facilities at Haynes Park. The OLRA is a 501(c)(3) and may choose its own membership policies. However, Town of Old Lyme property and facilities are being offered to nonresidents without recapturing the costs paid by taxpayers. For example, few adults participating in the OLRA programs have Town of Old Lyme beach & Haynes Park windshield parking stickers. The park parking lot is overflowing during practice. 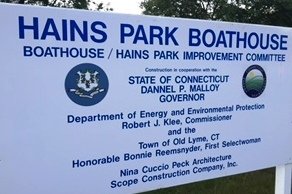 We are spending a lot of taxpayers money and expending a lot of time and resources of Old Lyme town leadership and committee members on the boathouse improvement project. Let’s make an effort to recapture an equitable amount that more than reflect taxpayer’s costs from those using Town facilities who are not taxpayers of Old Lyme or are not students of Regional District 18. The surrounding towns do not reciprocate offering the use of their facilities to Old Lyme residents in the manner that we have done since the original boathouse was built.